When you need to upload a large number of files to a locker, there are two ways to do it: upload a zipped archive of files as described below or use the My Locker icon located at the top of every page in your ports. The My Locker option allows you to easily manage all of your lockers from a single location. You may use drag-and-drop to upload many files at once and you can rearrange the contents by copying or moving files between folders and lockers. Visit our Lockers page for more information. 1. Log in to your School Loop account and click My Locker on top. 2. Simply drag and drop your zipped file onto the page. 3. The system will then prompt you to choose to upload the file as a zipped archive or to unzip the file on upload. 1. Log in to your School Loop account and click My Website on top. 2. 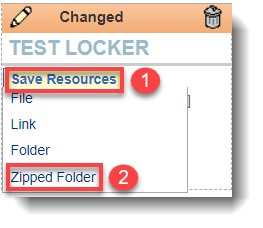 To upload a zipped file to any locker using the Save Resources menu, choose the Zipped Folder option. 3. When prompted, choose the zipped file from your hard drive containing the files you wish to upload. The School Loop system will unzip the files and restore the folder structure. How your files are displayed in your locker depends on how you zipped your files and whether or not you used the optional Name field when uploading (see image below). If you fill in the optional "Name" field, a folder with that name will be created in your resource locker and the contents of the zipped file will appear inside that folder. Several examples here will help to illustrate how to make the best use of the zipped folder options. In this first example, 3 loose images are compressed in images.zip. If you upload this file using the Zipped folder option, the three images will be added to the locker as if you had uploaded them one at a time. 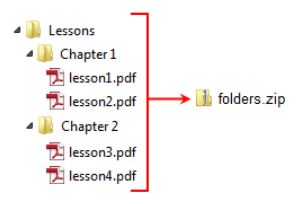 In this second example, a folder called "Lessons" contains two additional folders, each containing 2 PDFs each. All of these folders and files are zipped into folders.zip. Uploading this zipped file will create the same structure of files in folders in your locker.